Texas has long been known as the capital of oil and gas. And over the past decade it added so much wind power that if Texas were a country, it would be the world’s fourth-largest wind producer. Looking back at the past few years, a fourth energy trend can be added: the growth of solar photovoltaics (PV). Texas has added 1.8 GW of solar to date, more than 80 percent of that in the past two years, ranking it third in the nation by new capacity. The Texas solar industry now employs about 10,000 people, more than double the number of people employed three years ago. Astonishing even to solar power proponents, Texas’s main grid operator, Electric Reliability Operator of Texas (ERCOT), forecasted that solar would be the only economically viable new power source from now to 2031 in six of eight potential scenarios, forecasting between 15 and 28 GW of new solar PV. Most of Texas’s solar installations have been utility-scale: large arrays installed on vast swaths of arid land, transported by high-voltage transmission lines to cities like Dallas, Houston, Austin, and San Antonio. Yet now a different revolution is picking up steam. This revolution is driven by local electric cooperatives (co-ops) and municipal utilities (munis) buying “distribution-scale” solar—1 to 10 megawatt (MW) arrays installed on the distribution grid, in or on the outskirts of cities. 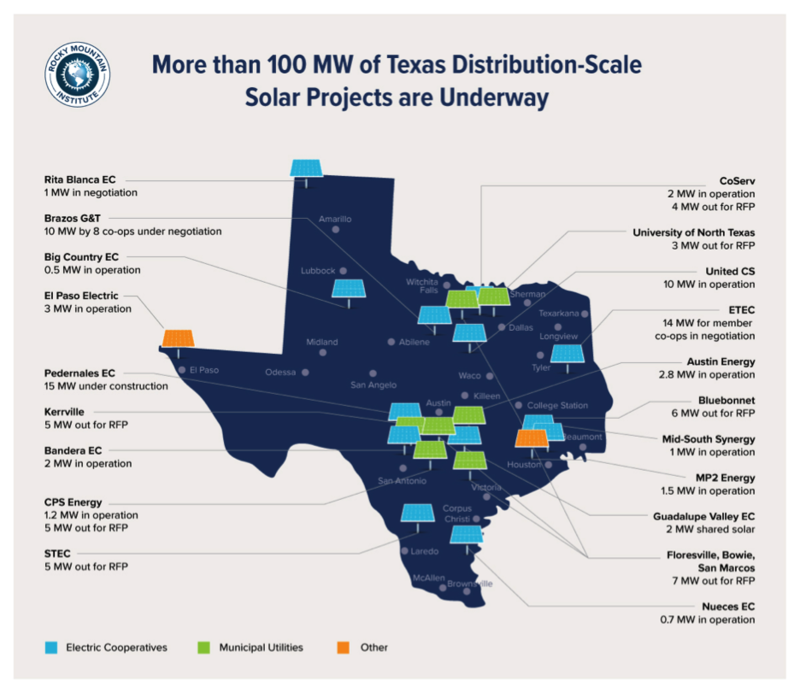 More than 20 small Texas utilities have pursued distribution-scale solar, now totaling about 100 MW, the equivalent of a small natural gas plant. The main reason for this surge in distribution-scale solar is favorable economics. A single 1 MW solar array can save small utilities up to 50 percent of their power procurement costs, achieving net present values (NPV) of about $1.5 million per array on 20-year power purchase agreements (PPAs) in West Texas (or between $250,000 and $1 million in Central Texas, due to lower insolation and more expensive land). What causes these favorable economics? On the one hand, costs have come down dramatically. Costs for 1–10 MW systems have decreased by more than 50 percent in five years, from $4.50/W in 2011 to $2.20/W in 2016—and today’s prices in Texas are likely half that.